Pizza is one of the most beloved foods across the globe, but it can be more than sauce and crust with savory toppings; it can be made into a delectable treat that’s as mind-blowingly delicious as it is waist-expanding. While the following dishes may tempt you to the point that you’ll need to join Weight Watchers, the time and money required to get back in shape will be more than worth it once you’ve sent your taste buds to cloud nine. Apple pie is as American as baseball and fireworks, so it’s only fitting that the first concoction you explore would be filled to the brim with the sweet red-peeled fruit. Christy Jordan’s Southern Platewebsite details one of the best true-to-restaurant recipes for home cooking, and if you really want to make people think you ordered out, this is what you should make. 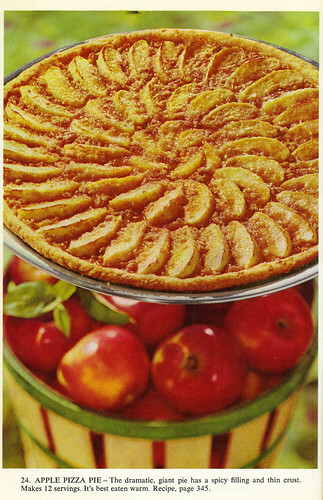 If apples aren’t your thing, or you’re just craving some variety, the first fruit pizza recipe on allrecipes.comcan provide you with something that’s both more colorful and more subdued. While the Apple Doozie is all about providing your taste buds with a dose of maximum sweetness, this fruit pizza recipe offsets the sugar with a bit of cream cheese while making up for it with every fruit of your choice. If you are looking for a flavor to enhance the natural taste of the fruit instead of just making it sweeter, this will knock your socks off. This is one of the big ones. Before you pop this thing into the oven, you should make sure you’ve got your dentist on speed dial. This Food Network Frankenstein is meant to be topped with bananas, peanut butter, chunks of chocolate, candy-coated chocolate and marshmallows. This is what you should make your kids if you want to give them something better than a birthday cake, and as the name suggests, it’s the perfect pick-me-up when you’re getting over an ex. Who needs them when you’ve got so much chocolate? If you’re not afraid to get really elaborate, this is the perfect choice for a dinner party or when you really want to treat yourself. The crust is made from brownie mix; that should give you an idea of just what you’re in for. The Food Network has delivered again, so make sure to send them your regards before you enter a sugar-induced coma. This is a far simpler concoction than a few of the other recipes you’ll find out there, but one should never underestimate the appeal of smores. If the inner child in you is begging to be let free, make this and let it go wild for a night. It’s the closest you’ll ever get to a second childhood. Pizza is one of those foods that humankind will never stop improving upon, and if you stay on the lookout, you’ll find unique recipes that outclass everything that you’ve ever tasted. Loosen your belt, prepare your belly, and let the sweet food-induced ecstasy wash over you. David Hong is a food aficionado with a sweet tooth. If you are looking for some more traditional style pizzas, he recommends ordering from New York pizza delivery.